WIP Progress, Springing and a Tutorial! How is everybody doing today??? Did ya miss me? Laid low again with a weather-sparked migraine that lasted a week, eek! 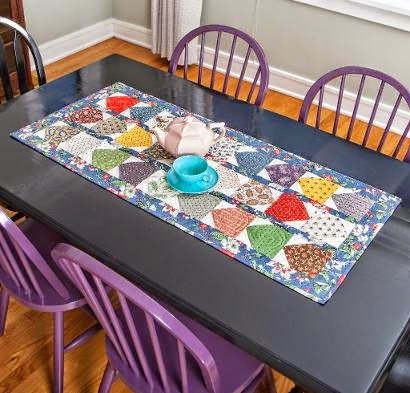 Before I was incapacitated I managed to get my citrus batik table topper put together-border and all! I am still amazed at how pain-free the HST's were…guess I never bothered to measure and trim them before…ha ha ha...it had been that long since I worked with HST's! I have spray-basted it to some older-stash fabric and am good to go for quilting…but I am still undecided on which pattern to FMQ(free-motion quilt) with my Pfaff. It will be on our large coffee table and will get spilled on, folded over and generally well-used so I think it should be densely quilted. The one that is on the coffee table now was quilted with a fairly tight meander and while that is the easiest FMQ design to do, I am a little bored with it. This was made with two packs of Timeless Treasures charms I got from Craftsy during their Boxing Week Clearance Sale. I actually bought 4 from them and don't know just yet what I'm going to do with the other two packs. I had a few squares left over from the above project as I was working with specific dimensions, so I'd like to work them into the next project as well. I took this picture early last week. This is part of the tree that is in our minuscule back area. This one usually grows so much in the summer months that it ends up touching our kitchen windows! 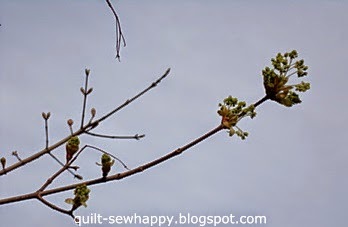 Now, would you believe, the buds are fully open and little leaves are starting to grow. I don't really like to use the spray starch in a can as it has an icky slightly-sweet smell…and of course, the fumes and the ozone layer. This recipe is a mix of a couple I have seen online with a few personal tweaks! 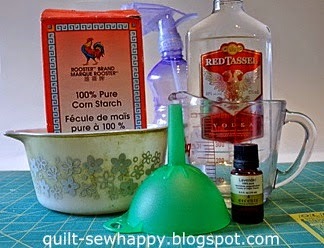 In your mixing bowl combine the water, vodka and cornstarch and mix well using a fork. Don't add the essential oil yet! 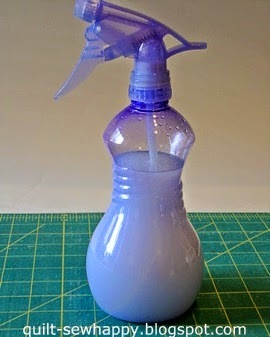 With the help of your funnel, pour the resulting liquid into your spray bottle. 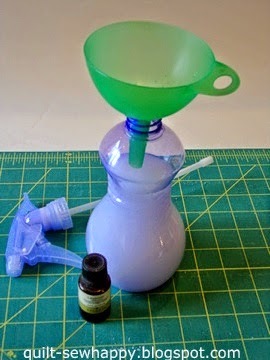 Remove the funnel and add your essential oil. I use lavender as it has a nice smell, but you could use a different oil such as peppermint or rosemary...but no citrus-based oils as they can leave oil spots on your items! Now give your spray starch a hearty shimmy & shake. This helps to mix the essential oils in well. The reason I wait till the end to add the essential oils is that I don't want to waste any of it in the mixing bowl. Just mixing the oil in with a fork will not disperse the oil throughout the spray starch mixture and some of the oil will stick to the bowl's sides, which is a waste in my opinion. Now, keep your spray starch near you ironing board and spray, spray, spray away, but use sparingly-a little will go a long way! Just remember to give it a good shake before each use as the cornstarch tends to settle to the bottom once the bottle is set down. It should stay fresh for a month or two! When not in use, I put mine in the fridge and it lasts longer. 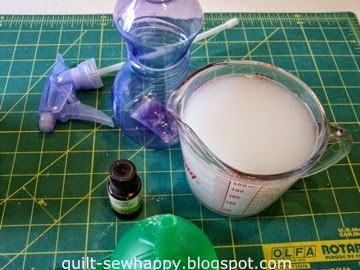 If you find that you have some white residue on your fabric after the spray has dried, just give the area a little swipe with your fingers or a damp cloth. The white residue is just plain old cornstarch! Why the Vodka you ask? Vodka(or any clear alcohol, but not rubbing alcohol) acts like a dispersant and a binder(emulsifier)-helps the essential oils mix with the water, and will also help the spray starch stay fresh, as it is a preservative. 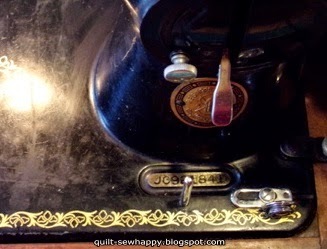 My model was one of the first of these models to come off the assembly line, as I noticed there are some things missing: the face of the stitch lever(on the right) doesn't have any numbers on it for stitch length and there is no gold "Made in Canada" decal situated on the top of the machine head. I also now know that I put the needle in the wrong way...DUH! 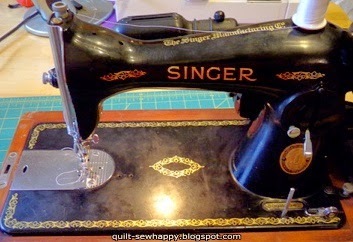 While on modern machines you put the needle in with the shank facing the back, this Singer must have the needle shank facing the left! I have also started looking on eBay and Etsy for a Walking Foot and a few other things I like to have. 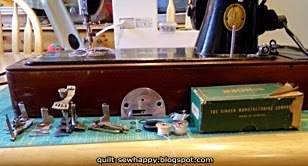 Someday I would like a wooden cabinet to store her in, so I could set her up in the living room and not have to move her on and off the kitchen table…Featherweight she is not!!! 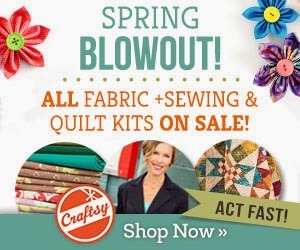 Today is the last day of Craftsy's Spring Blowout Sale! Scoot on over for amazing deals on fabric, sewing kits, and quilting kits! I have been looking longingly at this kit: Letters Home Tea and Biscuit Table Runner since Craftsy first shared it! When you use this link, just scroll down the page to see the kit. It is on sale HALF PRICE for $25.43(this is the price in CA$-it will be much cheaper in US$)!!! They even have a few of the lovely Aurifil thread sets…but these are going fast. 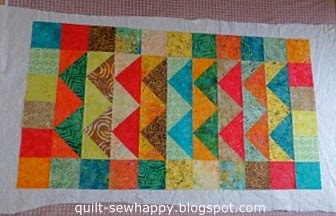 How should I machine-quilt my citrus batik table topper? I really need some ideas peeps! *If you mouse/hover over the top right corner of my photos, a red pin-it button will show up and all you have to do is click it to be taken to Pinterest. There is also another red button right beside it for posting to Facebook and Twitter. Or, you could always use the little grey square buttons at the end of this post. A New Addition to the "Family" and a recipe! So…can you guess what I just got??? 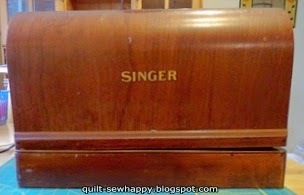 I found this vintage Singer on Craig's List, and my Uncle went to pick it up for me! She was a little bit dusty so I gave her a good clean. The wooden base has that slightly musty smell that wood gets when it is in storage for too long. That doesn't bother me so much, I can always stick a dryer sheet in there, to soak up the smell. Here you can see most of her decals...they are in excellent condition, and are quite pretty. Here's a close-up of the decals and her serial number. I had a look online and found a site which can help you date your machine and find out the model number. I think this is a 15-90 model, made in 1948…but I am not totally sure, so I also emailed Singer to see if they could help date her for me. On the bottom of the foot pedal it says "Made in Canada", but that is probably only where the foot pedal was made. The box with the accessories in it also said "Made in Canada"…so the mystery deepens! 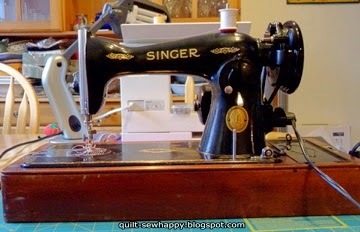 I'm hoping Singer will be able to give me some info on where she was made. I managed to get her threaded and popped in the bobbin, but the stitches are not completing, so I'm not sure if it is the new needle I put in it, or possibly I threaded it incorrectly. All in all, still a good deal for only $45!!! I don't mind putting some $$ on her to make her run like a dream. So many people say how wonderfully these old cast-iron machines run. She sure is heavy though, the Hubs had to oomph a little to get her onto the kitchen table!!! This recipe was in the Vancouver Sun this past Wednesday,though it is actually from the Portlandia Cookbook. We defrosted a small chicken overnight on Thursday and made the soup on Friday. We all ate a hearty bowl of this soup on Friday for supper and there was enough soup leftover to be an accompaniment to a sandwich on Saturday night for all 3 of us. In a large pot, heat the oil and add the onions, chilies, garlic, cumin and salt and pepper to taste. Cover and cook over medium heat, stirring occasionally until softened-about 5 mins. Add the broth and tortilla strips, cover and bring to a boil. Simmer over low heat until the vegetables and tortilla strips are very soft-about 5 mins. Add the 1/4 cup of cilantro and using a stick blender, puree the soup until smooth. Add the chicken and hominy and simmer uncovered for 5 mins. 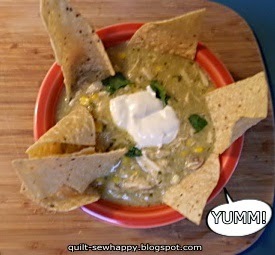 Ladle the soup into shallow bowls and garnish with sour cream, cilantro and broken up tortilla chips. Note-I would not omit the tortilla chips at the end as they add some needed salt taste to the soup. This was a fast and easy soup to make and is now a favourite. I hope it will become yours too! 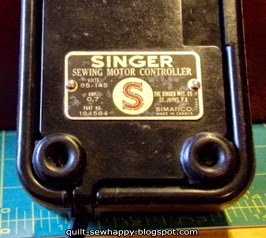 Does anyone out there own a vintage seeing machine, and if so, which one?also, what shall I name my new-to-me vintage Singer? PLEASE NOTE: The writer of this blog accepts forms of compensation such as, but not limited to; fabric/notions/patterns/books in exchange for a posted review. All comments/critiques/opinions are completely my own and are not those of the provider. This post may also contain affiliate links and I will receive a small commission if you make a purchase after clicking on my link. Thanks!